It was surprisingly easy. 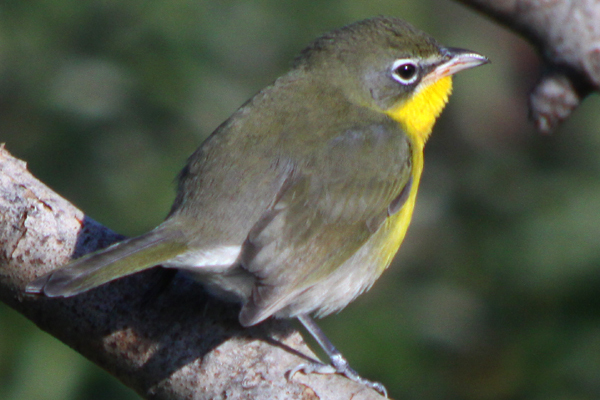 There were four of us birding the edges at Fort Tilden when I saw a flash of extremely bright yellow out of the corner of my eye. 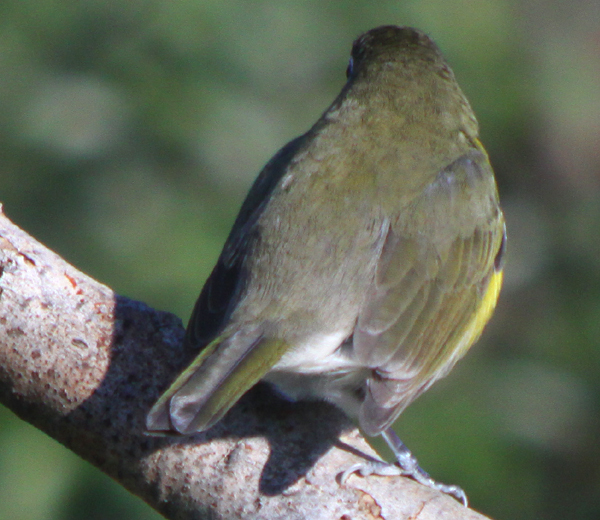 My bins were at my eyes in a second and I was focusing on a mostly dull green bird with a bright yellow chest and throat and white spectacles that was only about fifteen feet away on a bare branch in the sun. Using my excellent field-craft I blurted out “Chat!” and it disappeared back into the brush. 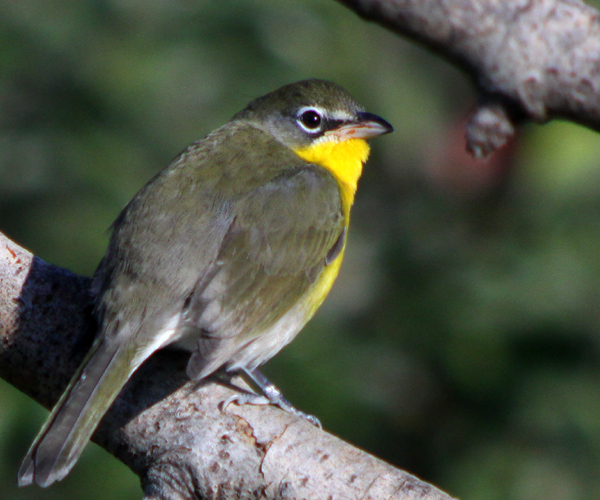 My first Yellow-breasted Chat in Queens, bird number 265 in the borough. Somehow, no one could get on the bird. I was convinced that I was going insane and hallucinating a chat. Finally, after what felt like an hour of torture but was more likely about fifteen seconds, Isaac got on the bird followed quickly by Seth, and, finally, Tom. I wasn’t crazy! But the chat sure was, sitting there in the sun and letting me get all of the images you see in this post. After about a minute-and-a-half of posing, as much as anyone can ever hope for from a chat, it took off back into the bushes and was not refound at all. *Please remember that all conversations that I report are simulated and even quote marks tend not surround actual quotes but theoretical ones. I really wonder why a Yank like you would enjoy seeing a Chat. They are the nastiest, meanest thing the South has let loose on you since the end of the Civil War, being secretice skulkers in the (“former”) Union states while being almost obnoxiously easy to see out in the open, singing their hearst out within the (“former”) Confederacy. 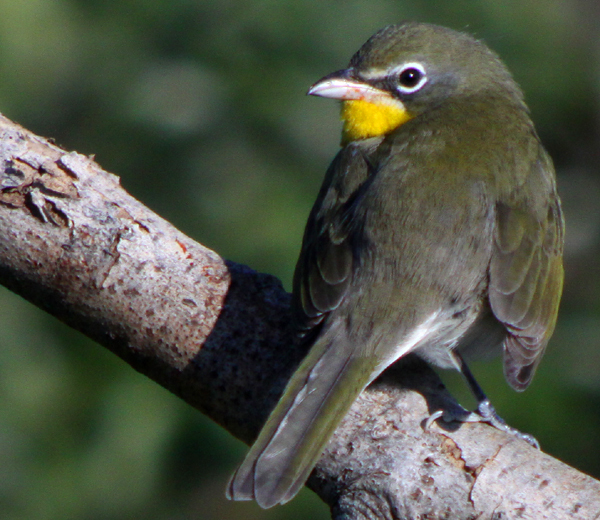 And I bet chats have enslaved Common Yellowthroats in the south! Well I didn’t get that good a look at it. I guess because it’s back was turned to us and I was very anxious to see it I just could not focus on it. 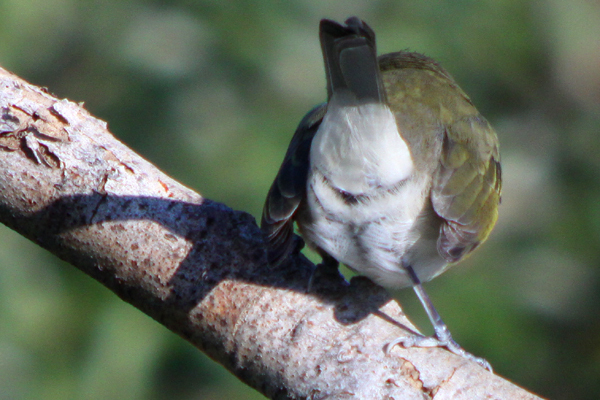 I didn’t see it till it flew back down into the scrub and was than just a blur of yellow. Issac and I stayed another 10 to 15 minutes trying to pull it out as it was a state bid for me but we had no luck. @Jochen: Stop trying to start a second war American Civil War! @Tom: It is so weird that after the pictures above it was not refound at all. Where do these birds disappear too? That is awesome! And images too! I need to find one of those bad boys for Costa Rica. They supposedly winter in much of the country but their typical, anti-birder, skulking prowess leaves us wondering if they maybe opted for a winter break in Nicaragua instead. I don’t think I’ve seen a Chat in New Jersey yet, just in Virginia and Maryland. Chat is still missing on my life list. Had one just across the river from me this fall, but it only hung out for about an hour and was never found again.